Hundreds of plates have been seized in the 11 days of the new law. Transitos have 72 hours to bring to Cosevi the seized plates. 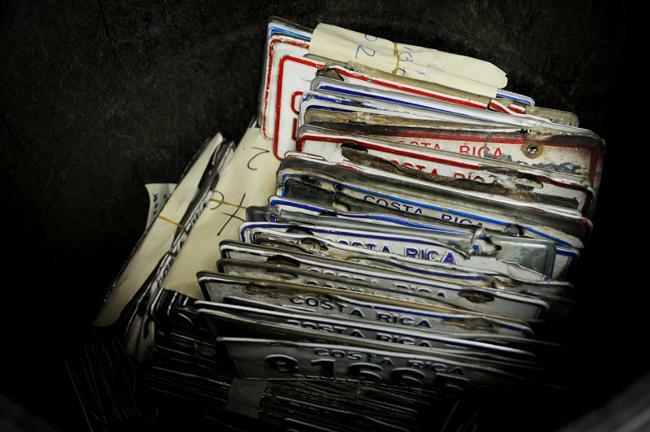 Q COSTA RICA – Drivers who have their vehicle license plates confiscated for parking illegally, such as in ‘yellow zones’, on sidewalks or other prohibited areas, in addition to having to pay the fine, will have to wait at least three days to recover the plates. That is because the Dirección General de la Policía de Tránsito (Traffic Police) gives its officials 72 hours to hand over the seized plates to the Consejo de Seguridad Vial (Cosevi) – Road Safety Council, where they can be claimed. Since July 17, reforms to the Ley de Transito (Traffic Act), Transitos (traffic officials) have had the power to fine illegally parked vehicles in the absence of the driver. In addition to the fine, Transitos can also tow the vehicle and/or the preferred action, confiscate the license plates. Previously, Transitos could only sanction if the driver was present, a situation that had practically provoked an atmosphere of impunity on the roads across the country. In the 11 days the change in the legislation has been in effect, the Policia de Transito reports the confiscation of 600 pairs of license plates. In addition, Municipal Traffic Police officials have seized 900 pairs of plates in different cantons around the country. “When the change was made in the legislation, a specific period was not established for that process…to us three natural days seems a reasonable time,” said Mario Calderon, the Director of the Policia de Transito in explaining that the 72 hour time period established for the officials to hand over to the Cosevi the seized plates. Although the change did not affect the amount of the fine, ¢52,000 colones (plus costs), or the towing or confiscation of plates, the change is that driver does not have to be present when the Transito takes action. Calderon said that if as driver finds his/her car without license plates, they need to contact the Cosevi for the payment of the fine and the return of the plates. During that time (license plates confiscated) drivers are exposed to a ¢306,000 colones fine for circulating without the plates. That is to say if you find your vehicle today without license plates (assuming the vehicle was illegally parked and plates confiscated by a Transito and not a victim of vandalism) you should count out three days, on the fourth day go to the nearest Cosevi. Important here is that the plates will be at the nearest Cosevi where the plates were confiscated. For example, if your plates are seized say in Playa Tamarindo, in Guanacaste, the plates will not be in Cosevi office in La Uruca, San Jose. If you have the patience to wait on hold on the phone or have the time to go to the nearest Cosevi office, you may be able to recover your plates sooner. Director Calderon’s explanation of “three calendar days” (72 hours) is for his officials to hand over the plates to the Cosevi, however, since government offices are not open on weekends and legal holidays, the three days can be four, five or more. For example, if you have your plates confiscated on a Thursday of a long weekend, it may not be until the following Tuesday until you can claim them. And then the long lines. In addition, to reclaim the plates, the Cosevi requires that the Riteve (vehicle inspection) and Marchamo (Circulation Permit) is current; and any outstanding traffic fines be paid up. See here the regulations for the claim of seized vehicles and plates (in Spanish). So, don’t park illegally if you can avoid it.